A refreshing and new premise for YA but a tragically real situation for some, Change of Heart throws into question the value of life as a teenager. The natural mindset is invincibility but what happens when a teen goes from running across a soccer field to being high on a heart transplant list less than a month later? Though there have been other heart transplant books, this one is unique both in premise and execution. Emmi is a well balanced character at the start, having some teenage moments but overall, motivated and determined. Her relationship with her parents is good more often than not and her love of soccer apparent. She is a strong athlete, a good friend, and has a bright future. But when she falls sick and the infection infiltrates her heart, things change. Her reactions, though irritating on the surface with her fits and tantrums, is understandable and heartbreaking. Her struggle to comprehend what is happening and her resistance to both the prospect of death and a long rather than short recovery lend reason to her responses. Each time she lashes out, it is clear she is lashing out at the situation more than the person. Throughout the entire book, she grows tremendously as a result of the dire situation she has faced. While some aspects take longer than others, Emmi comes to face things in her own time and manner. Even after her transplant, when her friends and boyfriend don't often come, Emmi is able to understand their side of it- no matter how much it hurts her. Sam is a loveable character to start, spending time with Emmi and distracting her from her current state. Though driven by hormones at times, the way he cares for Emmi is clear. He also adds an intriguing element to the story because although he does care for Emmi and fell for her after she became so ill, he is still a teenage boy who is now having to potentially face death on account of her. Maurer does a splendid job painting him across the pages, giving reason to his actions in the same way she does Emmi. Though it isn’t necessarily the best, the reader can understand his motivations. Abe adds another element, a teenage boy who has already had a heart transplant. He offers something to Emmi no one else can and is a highly likable, swoon worthy character. He’s easy going and laid back, and fully appreciative of his life. He understands Emmi’s fears and pain and adds plenty of comedic relief once he makes his first appearance. Though Emmi had been dating Sam, after her transplant and his sudden distance, she finds herself paying more attention to Abe. The teenage love triangle aspect of this book makes it a steady read, still keeping a young spark in a rough situation with no promise of final mortality. As the plot progresses, it shifts between sickness and potential death and teenage love and feeling. Maurer blends and transitions amidst them seamlessly, keeping the pacing and flow smooth. Her writing is strong and compassionate, bringing Emmi to life. Some of the events and decisions are shocking and ones people could at first disagree with, the situation and personal realizations Emmi has come to help drive them. This book is a very perfect example of situational decisions, and the way her entire outlook and way of thinking changes comes across boldly. Also notable is Emmi's struggle with the knowledge that for her to live, someone has to die. This is a very hard concept for anyone to wrap their head around but also brings up how important organ donors are. 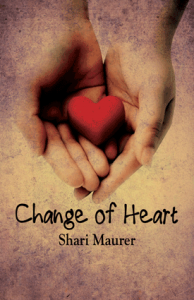 With several twists and a few very emotional, intense scenes, Change of Heart is a stunning debut. Wrenching but memorable, stunning and remarkable, this book is one that will make a reader appreciate their own life and health as well as give the reminder no one is invincible, regardless of age. Big events can drastically change a person and Maurer has portrayed that fantastically. Two fold with meaning, Change of Heart also stresses the important of organ donation and making those wishes clear in advance. It is simple to sign up to donate, many states even asking on driver's license applications/renewals. Without donors, someone like Emmi could be left waiting- sometimes too long- and this urgency also comes across as boldly as everything else Maurer has incorporated into this book. I was already looking forward to this one. Now I can't wait! Your review got me all excited :) Thanks! Awesome review, you make me wanna read it! This looks great! I've always liked books about teens with significant health problems (hmmm...that sounds kind of weird, but I really don't mean it to be). I sucked up Lurlene McDaniel novels when I was a teen. Did you like those? Change of Heart sounds more mature and intense than many of these books. Great review!